Happy end of March! 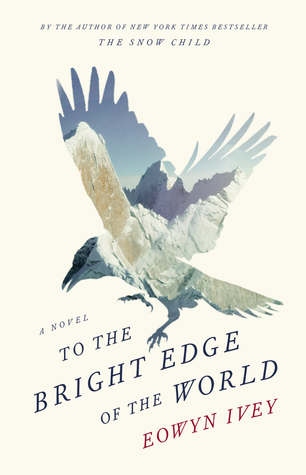 This month Blodeuedd and I read and discussed, "To the Bright Edge of the World". Blodeuedd is in red and I am in blue. Yay, another Ivey book! I have wanted to read it since we read The Snow Child. It was not as good as the Snow Child, because they were really different. Yesss! I was so excited when we decided to check this out. I think there is another book. But yes, it was very different. At first I did not really know cos it was..different! ;) I missed the magical strangeness of the Snow Child, but it just sucked me in. I do like her writing and it had me reading, and reading, and reading. And I can not really explain why, because not a lot happened in a way. There was a tiny, tiny couple of moments that were surreal, BUT that was because Allen and his company were starving. Hahaha. I agree. Normally I would’ve been bored with the lack of stuff happening, but the author has a way with her writing that keeps you hooked and wanting more. Exactly, they were starving, can one really trust what they saw. Of course, I did like the surreal stuff and I want to believe it was real and not just the sickness, scurvy and lack of everything that made them think things. And she really is an amazing writer for getting hooked liked that. So...how did you like the format of the story? Like with the diary entries, letters, pictures, and jumping POV? I liked it, it worked for me. I did not need the old guy with the curator, but it did bind the story together. And Sophie’s thoughts worked nice in the way it was done. Me too, but I loved her she found her passion with photographs. That suited her. Gotta do what you gotta do. I loved the added photos and drawings. It really made it feel like a collection of stuff instead of just a novel. Did you do any research after reading? I did! I didn’t realize this was based of real people. I did not realise that! Now I feel bad for not reading up on them, I just assumed they were fake, and that she had taken her own pics or found some to use. But yes the drawings and photos were such a good bonus. I like reading reviews after I read a book and someone shared a link to Allen’s journey on the military museum website (that is the only reason I knew). The author took some liberties for sure, but she did well capturing the real essence of the people. I guess I have to google a bit later then :) I just assumed it was another guy who went on a journey and she used that to base this. But yup, I can guess where she took some liberties. I hope she writes something new soon. Her Alaska settings are really good. Yes, she does good with bringing the world alive. She has another book out there. Maybe we can check it out one day. I can only find a 29 page novella. Maybe that is what I saw. Mhmmmm. Throughout the whole book!? I liked it, it felt real for the army man he was. And no prob with the ending either. I didn’t start kinda liking it until his return home entries and he was miserable the entire time. I think it was because I wasn’t fond of the character so I didn’t enjoy his POV. The ending just kind of ended. I wish there was more. He sure was miserable, but I understood. I did not mind, I am glad he shaped up though cos else I would have been disappointed. He did shape up a bit. IDK I think I was mad because he left Sophie when she really needed him, but I get it...the military-mentality of doing his duty. I just wish they would’ve let her come. THAT doctor she had needed a kick in the romp. Ugh. He did not have much of a choice. Oh sorry, I can not leave on this important mission cos my wife is preggers, yeah, in that time he would have been without a job then. I Understood it like she would only have come to that place where that guy had that store, not on the entire trip. I can’t remember. But even that would’ve been okay. At least take her with you part of the way so he could come back to her quicker. I maybe being harsh on Allen because I am biased and I didn’t like him. Yess, I’m done lol. :D Done?